Here is what I wanted to accomplish. Client and Server VM’s to get me through the exams. Probably between 5-8 but they do not need to run at the same time and once an exam is done I will delete the VM’s. So I can create new once for the next exam. Harddrives and memory are the most expensive items on the list. I’m sure it can be done with other setups and be a little bit cheaper. If you created another setup then please leave a comment below this article and explain why you have chosen for your setup. I have downloaded the Hyper-V core (as this is free from Microsoft). I used the program linux pendrive to put it on a USB stick as I do not have a CD-ROM installed on the server. if you do the same just make sure you select windows 8 in the list otherwise it will not boot. Put it in the server and booted it up. Installed Hyper-V on the 500 GB disk, yes I know normally you put this on a SSD drive. But I do not have any. perhaps in the future. The virtual machines and virtual disk will be placed on the RAID setup. So if the 500 GB disk fails I still have all the data. Configured the PC name and gave it a static IP address. Made sure that remote was enabled. Now I can use it remotely and use Hyper-V manager and Server manager from my windows 8.1 PC after some tweaks in windows 8.1 as I’m using it in a workgroup environment. You can read here how to do this. Now that I have everything installed I need to configure Hyper-V. I want to be able to upload ISO images to the server for installation on VM’s. Like windows or Linux. I also want to be able to copy or upload Virtual disks to the server and I want to have access to the virtual machines directory on the server. in case I need to copy or move something. Repeat the step for all the directory’s you want and done. 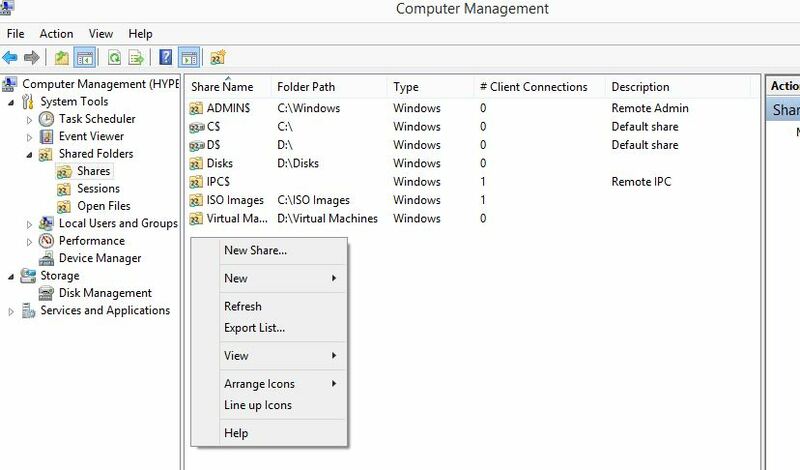 This is the easiest way to create and share folders on the HyperV server. You can also do this in servermanager trough the file and storage dashboard. But I wanted to show you an alternative way.